BIGFOOT'S bLOG: Bigfoot and Beer, Lost Coast Ganesh I.P.A. 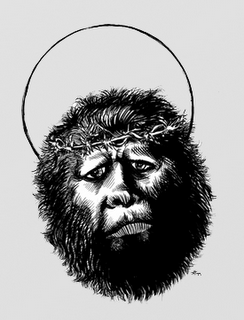 Controversy Surrounds Flatmo Image; Church of Bigfoot, Scientist up in Arms! Bigfoot and Beer, Lost Coast Ganesh I.P.A. Controversy Surrounds Flatmo Image; Church of Bigfoot, Scientist up in Arms! 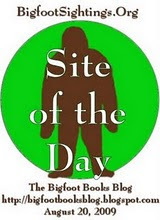 As we were preparing the blog entry regarding Duane Flatmo's BIGFOOT MURAL an article appeared on the front page of the Eureka TIMES-STANDARD newspaper (check it HERE: http://www.times-standard.com/localnews/ci_12881698standard.com/localnews/ci_12881698standard.com/localnews/ci_12881698standard.com/localnews/ci_12881698) regarding one of the labels he had designed for the LOST COAST BREWERY'S (http://www.lostcoast.com/) Indica IPA. Here, at left, is the rare image that has caused the controversy, now absent from the beermaker's web site, and now redesigned to remove the offending third and fourth arms, one of which once held a nice, frothy mug of this great beer. Fundamentalist Hindus seemingly without a sense of humor have been angered and are up on the internet seeking removal and recompense (including one lawsuit seeking $25,000 and $1 billion for damages "to compensate Hindus around the world"). Accusations of "hate crimes" have been hurled, threats of bombing and destruction emailed in, and the brewery has been forced to back-pedal from promoting their best (IMHO) beer. The T-S reports: "Briar Bush, the brewery's general manager, said he received a couple of hundred angry e-mails on the issue, about a dozen of which even threatened to bomb the brewery or contained other threats of violence." Online petitions have been proliferating on the WWW--Google it. Well, you can see the old image here. 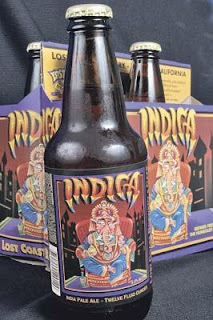 We don't believe in censorship, especially when the label here in question is an HONOR to Ganesh, showing Him as a jovial and friendly God offering many blessings... including beer. NOTE: The writer of this blog himself is a practitioner of Hindu-Buddhist philosophy, so please don't take offense. Ganesh is just alright with me! 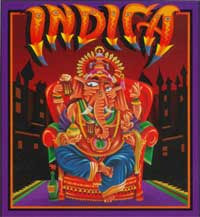 It should also be noted that INDICA is a variety of marijuana associated with Indian origins. It is a popular strain grown and much beloved here in Humboldt County. Hence, since the Hindus gave us (and are responsible for) this blessing/curse, they shouldn't be too angry that it is recognized by a Humboldt beer, an India Pale Ale no less. Plus, IPAs are very high in hop content, and the hop plant is part of the Cannabaceae (or Cannabis) family. One online petitioner asked whether Christians would be offended if Jesus were on the label of a beer bottle. We found evidence that he HAS been there. 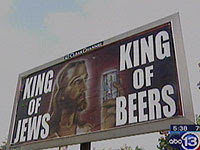 Check out, too, the hilarious video advertisements on http://www.jesusbeer.com/. Where in Hell (or Heaven) can I buy some of this stuff? Jesus, as is well known, was a hearty drinker of wine, so we presume he liked beer as well. After all, he encouraged his millions of followers to drink wine as the transubstantiated blood of his own sacrifice! Meanwhile, Tuesday, Church of Bigfoot, Scientist members, up in arms after hearing about the censorial actions of the Hindus marched down Fifth Street from their headquarters in the A. A. (Armchair Anarchists) Bar & Grill, and ordered a full round of protest pints of their favorite beer at the Brewery's pub. "Doesn't this remind you of the Danish Muslim Cartoon Protests," asked Church acolyte Zogboy. "No god without Beer!" said the Church's Reverend Lord. Indeed! The god, Ganesh, is the patron saint of commerce and luck, a quite fitting image to grace the front label of the beverage universally known as the nectar of the Gods, drink of conviviality, blessing from above. Ben Franklin, surely a wise man, once said, "Beer is living proof that God loves us and wants us to be happy. " In the world of BIGFOOT, now, beer is truly loved. 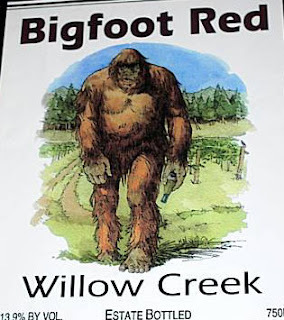 One bigfooting expedition this author went on featured a full keg of BLUFF CREEK ALE, from Six Rivers Brewery, tapped up at Louse Camp, downstream from the P-G film site. 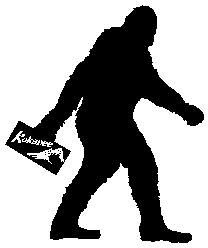 Following please find a true celebration of freedom and fun, and the love of SASQUATCH. Surely, we are not offended. 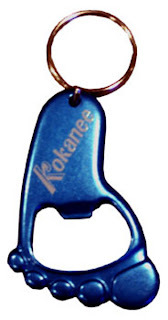 Even Rene Dahinden once did a television commercial for Kokanee Glacier Beer (it can be seen in the documentary, SASQUATCH ODYSSEY). SUPPORT THESE GREAT BREWERIES! SUPPORT FREEDOM! Six Rivers Brewery, http://www.sixriversbrewery.com/, in McKinleyville, CA, makes the good everyday-drinking BLUFF CREEK PALE ALE. Try it in the bottle or at the brew pub up on the hill in front of Raymond Carver's old pad. Sierra Nevada Brewing Company, http://www.sierranevada.com/, makes perhaps the best large-scale microbrews in the state of California, and is drunk nearly every day by the author of this blog. 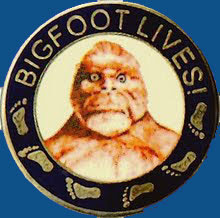 They produce a seasonal barley wine style ale BIGFOOT ALE, that is twice as strong as the average beer, and quite good. The label changes with each year's vintage. This year features a bottom-of-the-sixpack comic image that is rather amusing. 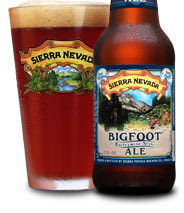 http://www.sierranevada.com/beers/bigfoot.htmls/bigfoot.htmlbigfoot.html I quote: "This year marks the 25th release of Bigfoot®. Our award-winning barleywine boasts a dense, fruity bouquet, an intense flavor palate and a deep reddish-brown color. Its big maltiness is superbly balanced by a wonderfully bittersweet hoppiness." Old Yale Brewing Company, http://www.oldyalebrewing.com/sasquatch_stout.html, out of British Columbia, Canada, makes the interesting SASQUATCH STOUT. 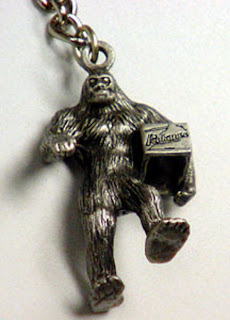 Other breweries have produced some interesting Bigfoot brews, knick-knacks, and iconography. The newer SKOOKUM BREWERY, out of Arlington, Washington, were at the YAKIMA BIGFOOT ROUND-UP, dispensing donation-only cups of their fine beers. I couldn't have survived those hot days in the speakers' tent without it. Check them out: http://www.skookumbrewing.com/. What IS a Skookum? 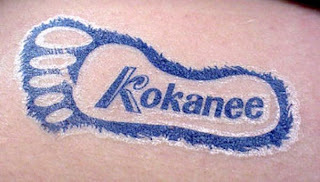 Check that out here: http://en.wikipedia.org/wiki/Skookum. Most images by Steven Streufert, though some were taken from official company images, or as credited. Above, the BIGFOOT BOOKS collection of sasquatch-related alcoholic beverage containers, so far. the TS article said that there was a mark of Buddha on Ganesha's forehead. From what I have studied about Hinduism, and from the Hindus I know, that would seem more offensive than the beer. A devout Hindu friend of mine feels as though Buddhism "dilutes" the true message. Not that Hindus are especially adverse to Buddhists, but Indians seem to historically prefer homogeny to diversity in their religious landscape and Guatama's followers muddy the waters for them. Of course there are exceptions. But I don't think Christ would be too into the use of his image to market ANYTHING. That would seem to go against his message. I'm sure he'd be ok about beer, however.